LUSAS Analyst contains a comprehensive range of unrivalled engineering analysis facilities to cater for all types of engineering design. From simple 2D linear analysis of beams and plates through to advanced 3D nonlinear shell and solid modelling, LUSAS Analyst will help shorten your design and checking times giving reliable results every time. An intuitive Windows-based graphical user interface gives easy access to the full range of powerful modelling and results processing facilities, together with on-line help. Regarded as a leader in engineering analysis, LUSAS Analyst is rich in powerful and advanced features to meet your analysis needs and extend your design capabilities. Some illustrative uses of the software can be seen by visiting our engineering case studies page. LUSAS Analyst comfortably meets your everyday analysis needs. 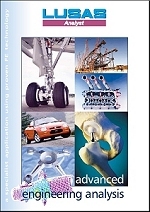 Unrivalled state-of-the-art element libraries and material models allow all types of engineering problem to be solved. Metals, plastics, foams, and rubbers can all be modelled. Isotropic and orthotropic models are available for linear static, linear buckling, and fatigue analyses plus natural frequency analysis for determining mode shapes. LUSAS Analyst lets you do more in less time. All models are created with built-in associativity allowing rapid design changes to be made. Automatic meshing is available and for certain types of problem LUSAS Analyst will automatically solve to a user-specified accuracy using adaptive analysis procedures. GUI results processing facilities allow extensive contouring, graphing and plotting for rapid interpretation of results. Unlike some systems, LUSAS Analyst goes well beyond your everyday analysis needs. Advances in technology require advanced software solutions. LUSAS Analyst offers these solutions now to give you the edge over your competitors. An easy upgrade from LUSAS Analyst to LUSAS Analyst plus and associated options gives an extended element set, additional material models, Fast Iterative Solver Technology and access to advanced analysis capabilities. A software key system means that you can call us at any time for a key to unlock these powerful facilities so that you can tackle new analyses straightaway. By using the advanced scripting language, user-defined menus, forms and wizards can be added allowing specific repetitive analysis tasks to be performed with a minimum of user involvement. Complete analyses from modelling to results processing can be automated - and all tailored to your way of working. LUSAS Analyst is also rightly regarded as the leader in nonlinear analysis with superior problem solving capabilities. Powerful facilities for geometric, material and boundary nonlinearity are available for problems involving large deformations, plasticity and collapse. Fully automatic load incrementation, automatic recovery from convergence failure and restart features are all designed to enable newcomers to nonlinear analysis to quickly become proficient in solving a wide variety of nonlinear problems. Results processing facilities provide automatic load-displacement graphs and viewing of yielded material. For low or high speed impact and contact problems LUSAS Analyst leads the field. Contacting elements are automatically detected and specially developed �slidelines� and �slidesurfaces� handle the interaction that takes place at contacting regions, greatly simplifying your analyses in 2D or 3D. LUSAS Analyst has a powerful set of thermal elements and extensive facilities for both simple and advanced, steady state and transient thermal analyses. Problems involving heat transfer due to conduction, convection and radiation can all be solved. Effects due to phase change of material can also be considered. If material properties are significantly affected by temperature distribution then a semi-coupled thermal/mechanical analysis can be performed. Changes to the component shape can also be accommodated by a fully coupled analysis. Model information can be exchanged with a wide range of CAD systems using industry standard exchange formats such as IGES and DXF, as well as directly with specific CAD systems using proprietary data exchange formats. LUSAS Analyst is available in two software levels; Analyst, and Analyst Plus to suit your analysis needs. Each uses the same Windows user interface for easy and rapid model generation, load application and combining of loadcase results. Both product levels use the same user interface and terminology, so training costs can be minimised and users can be introduced to LUSAS at the most appropriate level for the work they need to do. There is also full data compatibility across the products allowing easy migration of a model to a more advanced analysis when required without any data conversion or remodelling. Separate details list the capabilities of each particular software product. Software options extend the finite element capabilities of particular products according to your needs. LUSAS software is marketed and supported globally by LUSAS and also through a network of distributors and resellers that cover every continent. Used by thousands of users, LUSAS is highly regarded in industry, as demonstrated by an impressive list of clients, which include many of the top international consultancies. LUSAS software is also used extensively by government agencies, local authorities and smaller to medium-size consultants, many of whom find that the advanced analysis facilities not only expand their capabilities but also give them a competitive edge. Universities and research institutions throughout the world use the academic version of LUSAS, which provides a steady supply of proficient LUSAS users to support your use of the software in your industry. Any modelling and analysis capabilities described on this page are dependent upon the LUSAS software product and version in use. Last modified: April 19, 2018.